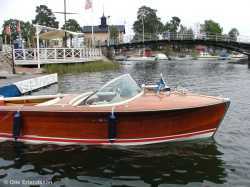 The Florida and Super Florida are two of the smallest Riva boats produced in greater numbers and for longer time. Counted together the Florida versions are the Riva model produced in most numbers ever. The model is very practical with its large sunken aft deck that can be used as an aft seat, a sun bed or a cargo space. Unlike most other Rivas bult in the 50's and 60's the Florida has a "normal" transom that slopes gently outwards-upwards which facilitates mooring and boarding. Florida has been regarded by many as the perfect water ski boat. Today it's very popular because of its perfect trailer boat format and to some extent its moderate price, although even this model pulled off properly during the last decade. The first Florida sees the light in the middle of 1952 and is largely based on the same drawing as the smaller model Sebino put into production earlier this year. 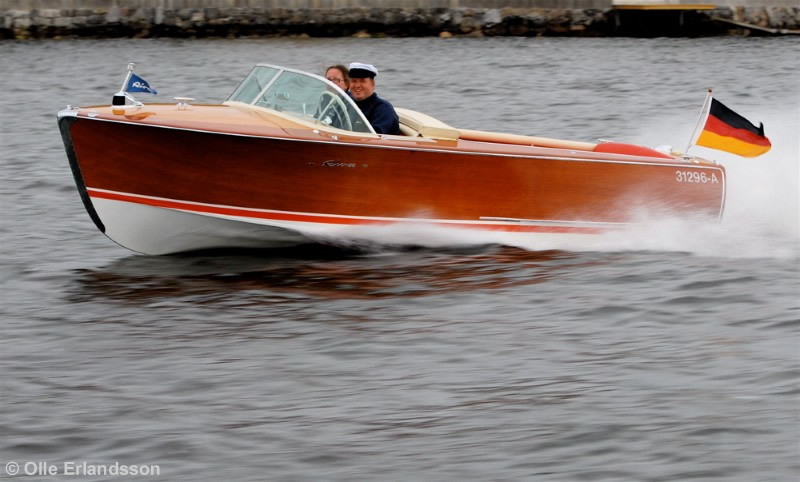 Like its smaller sister Florida is one of the first boats built strictly for series production, with little or no possibilities for the customer to influence the choice of engine, interior, upholstery etc. 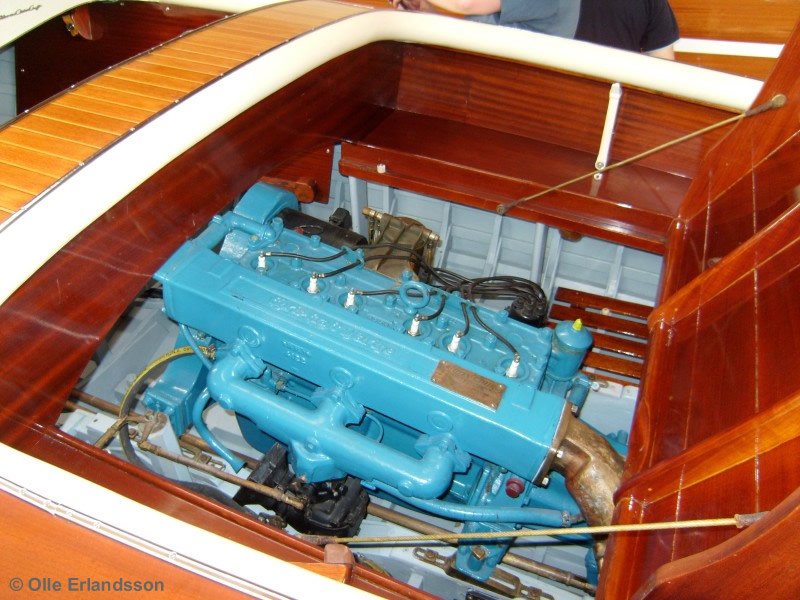 Only nine boats are built this year, of which the first two are fitted with the Italian BPM engine at 115 Hp, while six others is powered by the 6-cylinder side valve engine Chris Craft (CC) type K, rated at 95 hp. The windscreen is like its American archetypes in 2 pieces. The upholstery is made of padded green vinyl with a sun bed in green fabric. 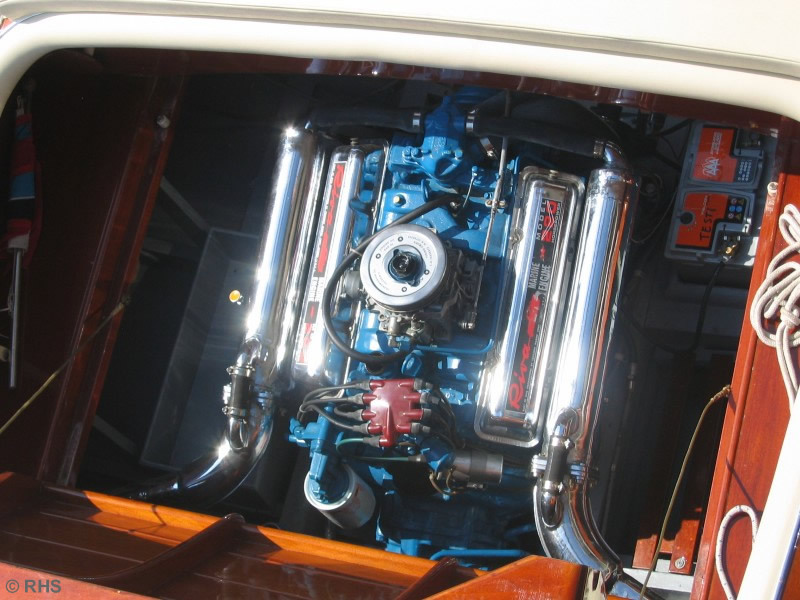 Boat #7 is a special one fitted with the larger 6-cylinder CC MBL at 158 hp and will thereby be the first Florida Super, even if the name is not yet in use. This years Florida differs from the previos one on several points. The windscreen is made in one piece and the upper edge of the cockpit and sun bed is fitted with a padded upholstered in light yellow vinyl. 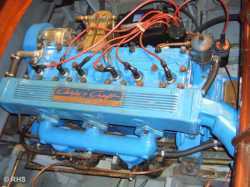 A number of boats are fitted with the stronger CC KCL engine at 120 hp. 18 Florida are produced this year and the last one, #27, is also powered by the bigger CC MBL engine. 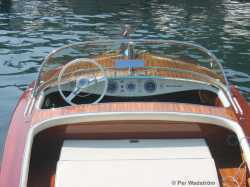 As other Riva models at this time, the bottom is dark green with a white-green-white strip at waterline. Same year as the new Riva yard is being completed the production increase to 31 Florida's. 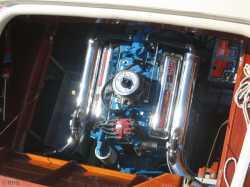 The last one produced, # 58, has the larger engine MBL engine and is for the first time officially named Florida Super. 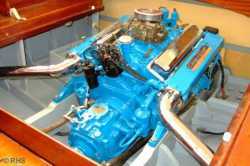 Most of the other boats (25) have the KCL engine installed. 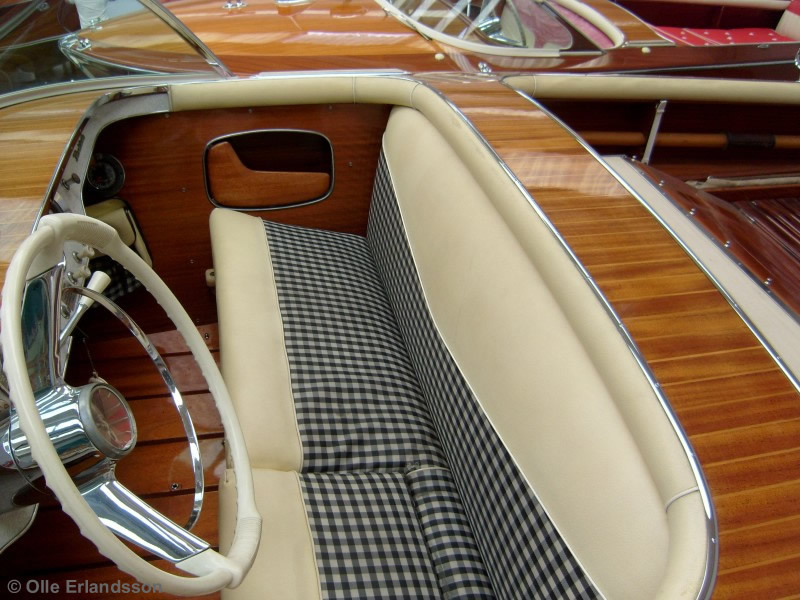 The upholstery is changed to a black and white checker pattern and a green sun bed. The Florida is this year priced at $4160 that could be compared to an new Volvo PV 444 at only $1700. Production increases to 36 Florida and 10 Florida Super. The Super version is now regarded as a separate model and get a slightly larger hull with a length of 5.82 and width of 2.15m (standard Florida 5.4 x 1.9m). Both models will see several other modifications as denser frames, new steering box, Phillips screws at the bottom and a propeller shaft in Monel steel. Starting with Florida #148 a new deck is introduced. It's made of mahogany plywood with 4 mm fillets of maple wood. The intention is to get a stronger deck that moves less with varying moisture content in the wood. The upholstery is changed to a green tartan pattern and the Florida Super grow another 5 cm to 5.87 m.
Total production for the year is 39 Florida, most with the larger Chris Craft KCL engine, and 17 Florida Super with the CC MBL engine. 1957 is the year when the Riva boats really comes through and output increases dramatically for all models. During the year 45 Floridas and 35 Florida Super are built. For the Florida Super model, starting with #204, a brand new windscreen is introduced with the same panoramic shape as other Riva models. The standard Florida gets a slightly more powerful engine with the introduction of the Chris Craft KFL (131 hp) at the end of the year. The performance of the Florida Super is also enhanced when the CC MBL engine gets dual carburettors and is renamed as model MCL (175 hp). Florida Super grows a few cm to 5.9 x 2.16 and get a new upholstery with a red sun bed in fabric and the seat in red and white vinyl with a white padding along the upper edge of the cockpit. Probably the Florida S. also get its red bottom paint with a red/white waterline this year. 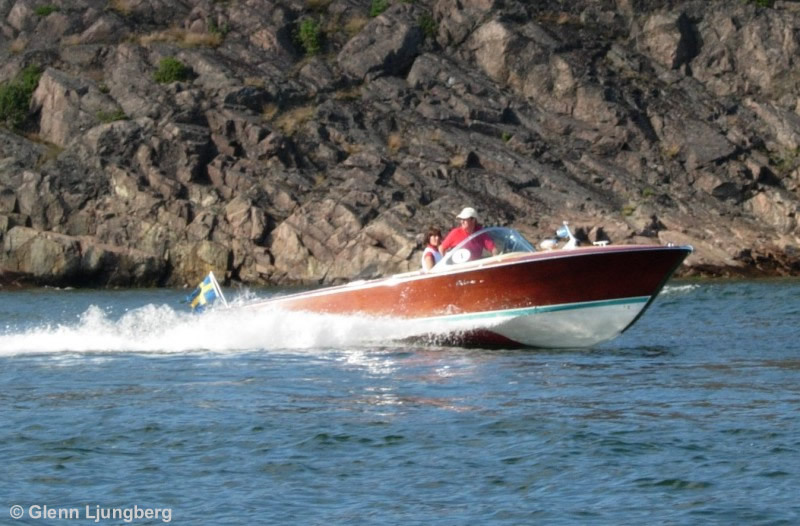 Florida Super #217 is sold to Mr Wennberg in Sweden. 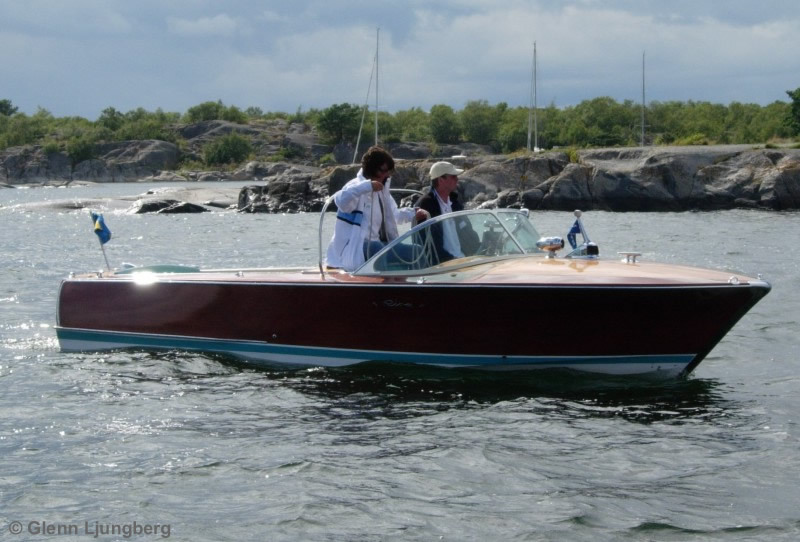 It's probably the first Riva sold to Sweden and the boat is still in Sweden, owned by a board member of the Swedish Riva club. 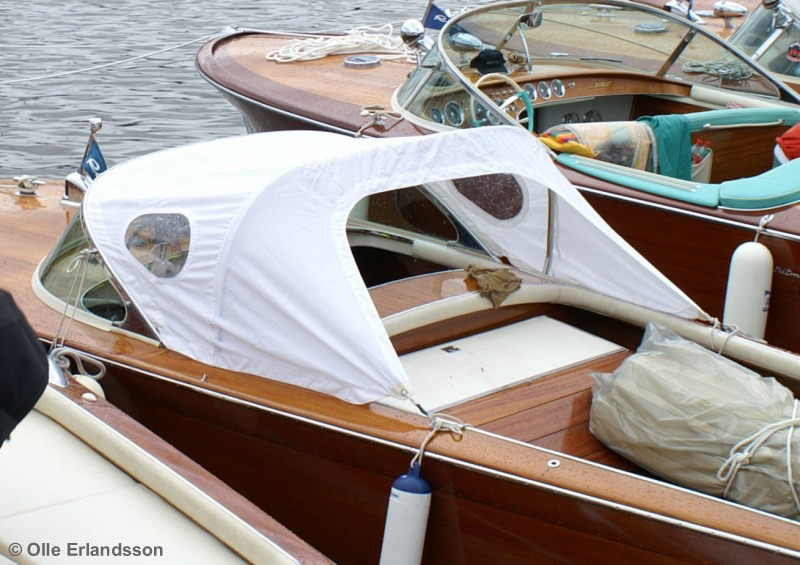 The big news this year and for both models are the introduction of hull sides made by preformed three-ply mahogany plywood panels in a single piece. 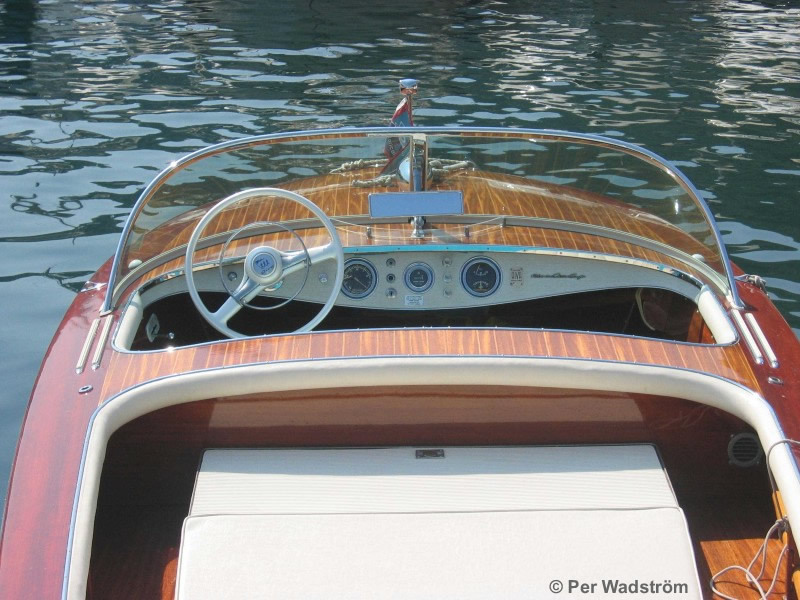 This revolutionary production method, developed by the Riva yard and Pirelli, gives a very strong, dimensionally stable, neat and tight hull that will not crack the varnish as easily as normal planked boats. Moreover, it also gives a significant reduction of the hours needed to build the boat. 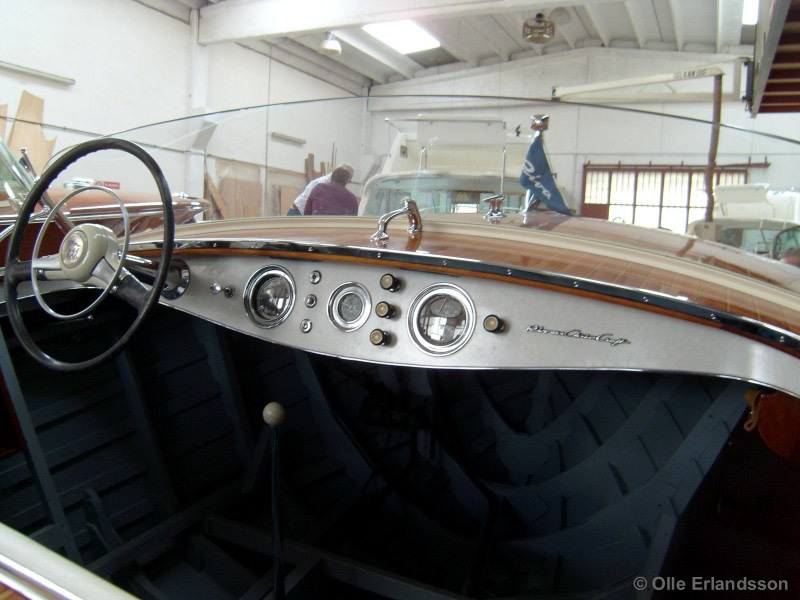 The transom of the Florida Super gets a slightly rounded shape when viewed from above and the Florida gets a panoramic windscreen in one piece. It's of the same design as previously used on the model Sebino without an upper frame. On the final Florida Super, #287, a new dashboard is introduced. It holds the new instruments from Steward Warner with a chromed frame, still with the Chris Craft logo on. Total production 1958 sums up to 35 Florida and 50 Florida Super. Florida gets a new upholstery with a black and white checker pattern and bright yellow décor. The sun bed is made of a bright yellow fabric and the padding around the upper side of cockpit and sun bed is also in bright yellow. The new dashboard is introduced on the Florida model with start from the first boat (#323) this year. The Florida Super gets a new V-shaped ivory colored décor on the backrest of the seats. The new steering wheel with the Riva logo and a small propeller in the center (named "Calyx") is introduced from Florida Super #372. During the year a total of 35 Florida and 54 Florida Super are built. The new steering wheel is also introduced for the Florida and the logo on the instrument panel changes from "Riva-Chris-Craft" to "Florida". Both models get a larger fuel tank (100 / 130 l) made of stainless steel. As for the other Riva models Phillips screws are now used for all the trimmings and fittings on the boat. The Florida Super is now renamed to Super Florida and the new name is highlighted by the new logo on the dashboard. All but two of the S. Florida built this year gets the new modern overhead valve V8 from Chrysler called Sea-V M80 with an output of 177 Hp. The new engine also means an update of the electrical system from 6 to 12 Volts. 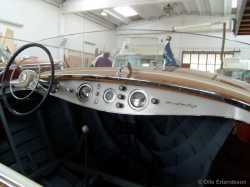 The gear lever also moves from the floor to the starboard side of the steering wheel at the dashboard. 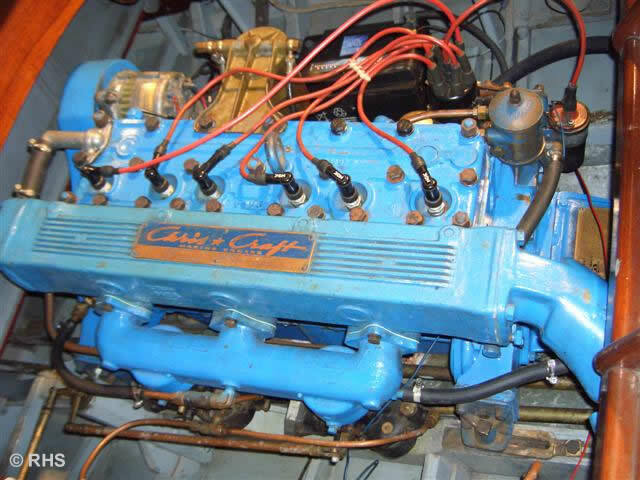 The smaller Florida have to settle with the old six-cylinder CC KFL at 131 hp. New for the Florida this year is a two-part panoramic windscreen set in a chrome-plated all around trim, just as its bigger sister. 36 Florida and 56 Super Florida are built this year. Four Super Florida is sold to Sweden this year. #412 is delivered to Nordic Yacht Assur, #417 to Mr K. Glant, #426 to Mr. H. Allercrantz and finally #436 to Mr O. Dahlberg. 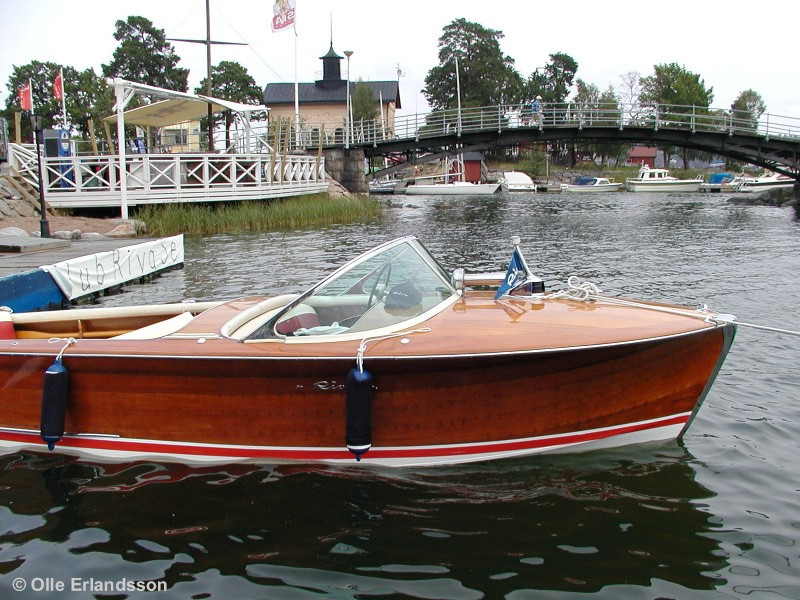 #426 is still in Sweden and owned by a Riva club member. #412 was sold to Finland in 2012. Florida will finally get a more modern engine, reverse box lever on the instrument panel and a 12 Volt electrical system. 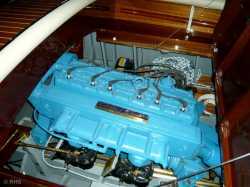 The engine is the Chris Craft 8V 283 (GM block) with the power reduced to 160 Hp from its original 185. This was probably done to avoid that the small Florida would get a more powerful engine than the bigger sister S. Florida, which have to settle with the Chrysler V8 at 177 hp. Both models get a slightly modified bottom amidships to give a smoother ride in the waves and the Florida grows a few cm to 5.5 x 1.91 m. It also get a slightly rounded transom as the Super Florida. Like the other Riva models both Florida models get the American police siren as standard equipment. From #544 the Super Florida get a new upholstery in a material called "Resin Flex". The color is "Lobster" (orange-red) with "Ivory" (cream) trim. During the year a total of 41 Florida and 65 Super Florida are built. 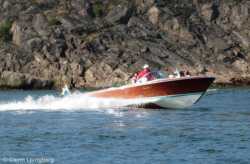 S. Florida #543 is delivered to Mr. Pehrsson in Sweden. 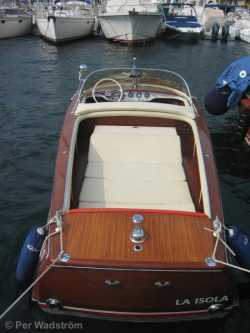 Today it's recently restored and owned by a Riva club member. 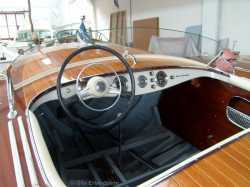 The Super Florida is further modified at the bottom and grows 2 cm in length to 5.92 m. The front seat is equipped with a flip-up portion of the driver's seat in the same way as for other Riva models. Else there is no significant changes to the two models. The production reaches new top levels with 50 Florida and 68 Super Florida being built. Very few changes are made during the year. The Florida gets a slightly more sloping bow making the lenght increasing to 5.57 m. The Super Florida grows as well and becomes 5.96 m long. On both models the chromed bow plates are extended to go further down below the waterline. Towards the end of the year the slightly more powerful Chris Craft 8V 283 at 185 Hp is introduced for the S. Florida. Production increases further more to 50 Florida and 81 Super Florida. A Florida now costs $6,260 (S.Florida $7,240), while a new Volvo Amazon is priced at about $2500 and a Cadillac from the same year about $5000-5500. 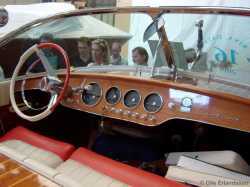 With the 1964 model the Super Florida gets a new dashboard in mahogany instead of the earlier in "Formica". 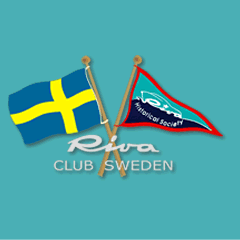 Also the new Riva instruments from VDO are introduced. The length change to 6.07 m when the bow rake is further increased. Florida is no longer built and the four boats sold are actually from the 1963 production. The Super Florida reaches 130 boats which is more than any other model of the yard. Only the Super Florida is built and no changes are made during the year. Production decreases to a total of 62 boats. The shape of the hull is slightly changed and the length increase to 6.15 m. Boat #952 and 953 are equipped with Crusader 220 (220 hp) engines as a test. Also boat #965 get this engine and is modified even more in the bottom with a sharper V, thus being the prototype for next year model. 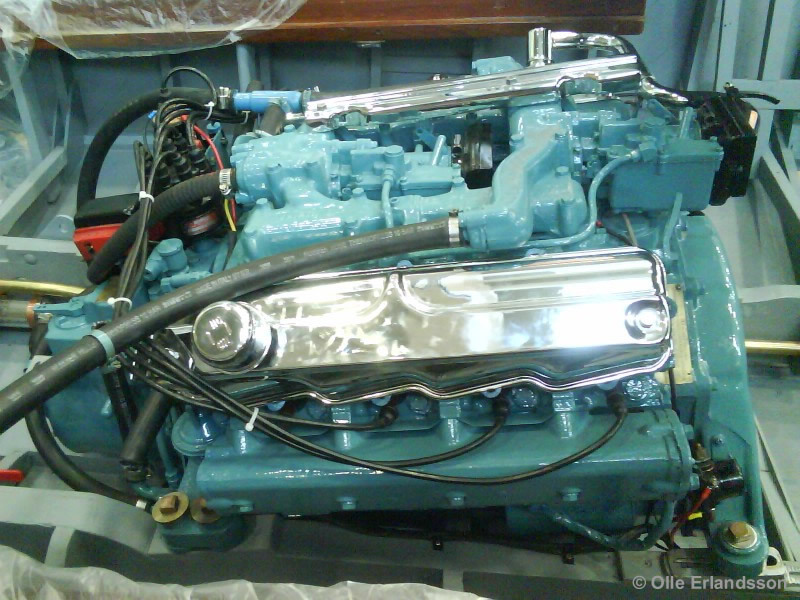 Starting from # 981 all Super Floridas get the new engine, now named as Riva 220. Total production ends up to 40 boats while the new "small" competitor Riva Junior is built in 113 copies. Starting with the first boat, # 992, the new and finally changes to the hull are introduced. The length is now 6.27, and the width 2.2 m. Also the upholstery is updated with wider ribbed padding on the upper edge of the cockpit and sun bed. Only 21 Super Florida are built this year. Only 16 boats are built during 1968 and the production is ceased in 1969 with only one boat built. The last one, #1029, is delivered to Luxembourg. 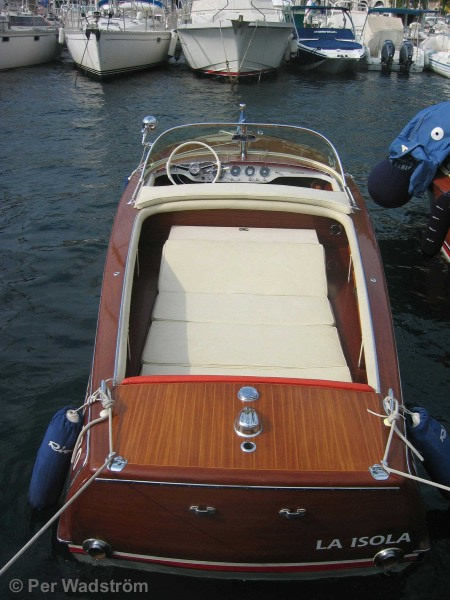 From #1023 the fore deck is fitted with a raised edge along the sides in the same way as earlier introduced on other Riva models. 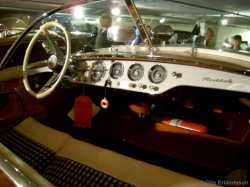 In the same year begins the production of the new model Olympic intended as a successor to the Super Florida. At the same time Carlo Riva sells the yard to the U.S. group Whittaker, who already owns several famous yards, including Bertram. The Glass fibre era is lurking around the corner and the year after the models Bahia Mar and Sport Fisherman are introduced. Both are based on hulls made by Bertram in the U.S. The observant reader notes that the last Super Florida has number 1029, but the total numbers of Florida + Super Florida adds up to 1137 boats? From the beginning the two models shared the same serie of numbers and this continued until 1961, when the last "Florida Normale" #542 was built. From boat #543 there will be Floridas and Super Floridas with the same serial number until the last Florida is built in 1963. This explains the difference of more than a hundred boats between total built boats and the last Super Florida number. Early Floridas (up to 1959?) had oars and oarlocks and could, with some difficulty, be rowed when the fuel ran out! Carlo the Legend, Riva the myth. Book I-IV by Piero Gibbelini. Vivariva. Riva Historical Society quarterback magazine. 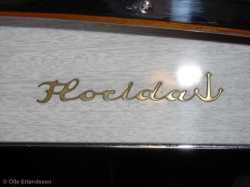 Florida logo on instrument panel, 1960 and on. Florida logo on dashboard, 1960 and on. Florida Super #217 1957, one of the last Florida S. planked on the hull sides. Super Florida #996, 1967 with the last bottom and more slooping bow rake. Super Florida #996 at speed. Florida and S. florida has a simpler hood instead of a real cabriolet roof. But has a perfect sunbed! 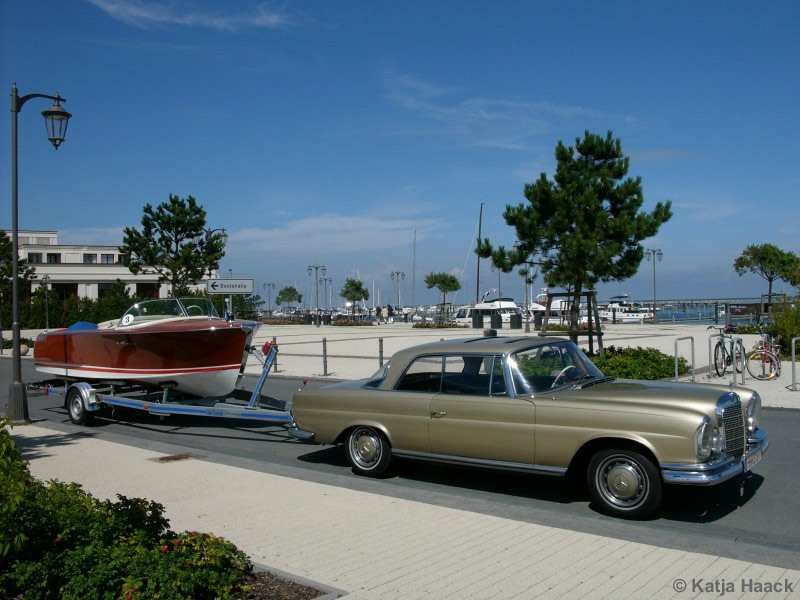 And it's the perfect Trailer Riva!